Priya Sarukkai Chabria is an award winning translator, writer, and poet. Her books include speculative fiction, cross-genre non-fiction, a novel, and two poetry collections. Her work is included in many anthologies, journals and websites in Europe, the US and India. She has collaborated with fellow writers, photographers, and dancers and has worked with moving images, miniature paintings and digital photomontage. She co-founded the film club, Friends of the Archive that specialized in screening silent movies and has co-scripted the short film, Dhaara directed by Suresh Chabria that opened The Critics Section, Oberhausen Film Festival, Germany in 1989. Sarukkai-Chabria has learnt Pali to read the Buddhist Jataka Tales. Aside from this, she translated the songs of 8th century Tamil mystic poet Aandaal as The Autobiography of A Goddess. 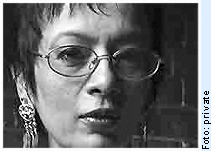 She has participated in The Creative Writer conference at the Writers’ Center, Norwich and has curated two seminars for the Indian Academy of Literature in 2007 and 2009. She edits the website Talking Poetry (South Asia) and Poetry at Sangam, and teaches creative writing. Priya received the Senior Fellowship to Outstanding Artists for Literature from the Government of India for exploring the validity of the classical rasa theory of aesthetics in contemporary writing in English. She was nominated for the 2017 Pushcart Prize and awarded for Outstanding Contribution to Literature by the Indian Government.